Sandy Weill is a banker, financier and philanthropist. He is a former chief executive and chairman of Citigroup. He and his wife, Joan were instrumental in the construction of the Gerald R. Ford School of Public Policy at the University of Michigan. Weill is a Trustee of the Gerald R. Ford Presidential Foundation. 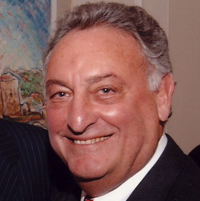 Sandy Weill was interviewed for the Gerald R. Ford Oral History Project on January 24, 2011 by Richard Norton Smith. Smith: I believe – correct me if I’m wrong – that the President came on to the Citigroup board in 1998? Weill: The answer is different than that. I met President Ford in 1980 when he decided not to run against Ronald Reagan for the Republican nomination, and he decided at that point in time to look around at a few companies and probably go on some corporate boards. Which he didn’t want to do if he was going to go back to Washington. Smith: Did he discuss with you the degree of seriousness with which he had considered running in 1980? Weill: I met him after he decided not to run. Weill: So he wouldn’t have discussed the seriousness, or lack of that because I didn’t know him then. And I was told to call him up and he would like to meet with me when he comes to New York. He came to New York in a couple of weeks. And I remember I called him up before he was coming, called him from my house in Greenwich, Connecticut and I remember writing in big print – DO NOT CALL HIM JERRY. CALL HIM MR. PRESIDENT. Because I’d not had too much experience speaking to ex-presidents at that point in time. So I spoke to him, and he was staying at the Waldorf and he agreed to meet. We hit it off pretty well and I invited him to come on the board of my company, which then was called Shearson Loeb Rhoades, which was right before we merged with American Express. And he agreed to do that. So that was the beginning of a business relationship, which became a very important friendship relationship with both he and Betty and members of their family over the next nearly thirty years. Smith: He took some heat, as you know, for “commercializing” the ex-presidency. And a lot of that was directed at the fact that he served on a number of boards. How would you counter that assertion? Weill: I would counter it in a major way. I don’t think that he ever sold the fact that he was on boards. Basically, here was somebody that had a unique experience that could be of great advantage to how a company operates. And you’re talking about a person that had the highest ethical standards and moral standards, and an enormous amount of common sense. So I think that he was a major contributor. I don’t think he was commercializing anything, at least as how it related to my company. And my company evolved over time where he came on the board of Shearson Loeb Rhoades in the latter part of 1980. In 1981 we sold our company to American Express, a year later he went on the American Express board, which he stayed on for the next twenty-some odd years. I left American Express and started a new company called Commercial Credit in ’86. Which in 1998 became Citigroup. So he was on the board of Commercial Credit, which through its name change to Primerica, through its name change to Travelers, to its name change to Citigroup. And stayed on that until a couple of years ago. And we had rules for directors that directors had to retire from the board, first at age 75, then we changed it to 72. Except if you were President of the United States. And if you happened to be President of the United States before you came on the board, you chose when you would leave. Smith: A nice exception. I’m sure one he appreciated. Weill: And one that was unique to one person. Smith: There was this caricature that was built up, between Chevy Chase and some people in the press. Tell me about Gerald Ford’s intelligence. Weill: I’d be happy to. I think that he was very smart, really with unbelievable common sense that could look at things and come to a conclusion. In a way he was a mentor to me in a lot of things because I learned a lot from him. Smith: What did you learn from him? Weill: One of the most important things that I learned from him is to have enough confidence in yourself that you are not afraid to hire people smarter than yourself. I think if you look at Gerald Ford’s presidency – at one time he had working for him Henry Kissinger and Alan Greenspan, just to speak of a few. And you can add Cheney and you can add Rumsfeld, and you can go on down the line. But that didn’t bother him. He knew how to handle them. And if you speak to Greenspan or you speak to Kissinger, of which I’m friendly with both, they will tell you that President Ford knew how to manage them. And so that was a very, very good lesson that I learned from him. And also just his common sense. He was always able to come to the point so that if we were talking about board issues, he was very, very helpful in the conversation. He had a unique experience in dealing with leaders around the world. One of the things I was incredibly happy about – a couple of things – one of them was that he was able to see, before he died, that the world changed its mind about his pardoning Nixon. Everybody now thought that he did the right thing. And that was so important for America healing. And he knew that that was changed. And I think another thing that was terrific was that my wife and I had the opportunity to be helpful when he was having a hard time in raising the incremental money to build the new building for the Ford school. That we were able to step in and get that done, and he was still able to go to Michigan and see the groundbreaking and know that that was going to be one of his legacies that last into the future. I remember one of the things that happened that was really funny when he was up there., It happened to be the day of a football game, and he had been an All-American center for Michigan when he played, and he met the current center of Michigan, who weighed 50% more than what President Ford, who we all thought was a big person, weighed when he had that same position. Smith: How large was your board? Weill: Our board varied in size from at one point ten or twelve, to as much as eighteen people,– after the merger with Citigroup. Smith: And for people who don’t know much about corporate governments, what kinds of functions, what kinds of contributions would someone like him make? Weill: In the 25 years, when he was feeling okay, he just never missed meetings. He never missed phone calls. I mean, one of the contributions that one can make is that you take seriously the fact that this is part of what you are doing. And he was great at that and that was a good example to other people – that this was an important job that you have. He always read the materials, and he added to our conversations, as I’ve said in a very, very important way. My relationship with he and Betty went to their business thing, but we also traveled around the world together. We were in Asia together in several of the countries. We were in Singapore, we were in Hong Kong. Together we traveled to Hawaii and a lot of cities around the country when we were having events and President Ford would stay there. It was always interesting when Betty, who I think also a great example to women and to Americans in how she discussed her addiction problem. And how nobody would believe her when she was crying out for help. And how she discussed her medical problems, which are things that affect lots of people and women, especially. But we all can relate to it in different ways. And how she can share those things to make the world a better place, and what she went on to build in the Betty Ford Center to help people. Whenever we traveled someplace she always looked for the local AA and made sure she went to that meeting. Weill: Absolutely. Whether it was Hawaii or Scottsdale, or this place or that place, that was the first thing that she did. Betty’s relationship with the President was really one of a lot of love and when the President gave up his pipe, he gave up his gin, and then he finally gave up the white wine. He did all these things which I know, having smoked a pipe and smoked cigars and drank the gin and still drink the wine – it’s not an easy thing to do. I remember once we went snorkeling with them in Hawaii and Betty loved it. For Christmas he called up and said, “Where do you get this kind of gear?” And what should he buy her. And I remember he bought her snorkeling equipment for her birthday to be able to continue doing something like that. Smith: So it sounds like they were up for the adventurous elements of travel. They were open to new experiences. So we had a very, very important relationship. And when he asked for help with what they were doing at the University of Michigan, to really get this building going, Joan and I said, they were really good friends, we’ll never know another president of the United States like we knew them, we should really go in and make this thing happen so he can see it. Smith: I know he was enormously grateful. The University of Michigan was really his second home. Weill: Right, I know. And to see the school flourishing now, I mean, we not only helped with the building, but we endowed the deanship, and there is a terrific dean there now, Susan Collins. She was in Washington and so we’re in contact all the time and how to really do things together with the Ford School to give it the kind of exposure. We’re trying to get people to go out and speak there. We’ve spoken to Frank Zarb about doing some teaching there, and brought Harold Ford out there to give a lecture. So we are involved, not just with a onetime thing in raising money, but in working with them to try and make this the kind of institution that he’d really be proud of. Smith: Did he have a sense of humor? Smith: Did he ever say anything that made you think that he was sensitive to the whole Chevy Chase caricature. Here was a guy who was a great natural athlete, yet who had been stereotyped as a bit of a bumbler. Was he sensitive? Weill: Do you have bad knees? I mean, he really had bad knees. He had both of his knees operated on. I remember his going into sand traps when he had the first one done, and those are pretty hard things to get out of, some of them, when you have two good knees. He had banged himself up, obviously, pretty much as a young man. So to say that somebody is a bumbler for that – I think he was a pretty good athlete and hit the ball strong, and hit the ball far. It didn’t always go in the right direction, and I played a lot of golf with him, so you always stood behind him when he was hitting the ball. Smith: Did you ever see his temper? Weill: I’ve seen a controlled part of his temper. I don’t think I ever saw his temper out of control. I’m sure there were plenty of occasions. Smith: Was it on the golf course? Weill: Not really. He was a gentleman on the golf course. We played with people that showed their temper on the golf course. Some of them were supposedly professionals. Smith: He strikes me extraordinarily self-disciplined. Even into his nineties, even up there at Beaver Creek with the altitude being what it was, he swam every day. He really took care of himself. Weill: That was another thing. My wife is a swimmer and she went swimming in his pool in Beaver Creek. And from that, we ended up building an indoor pool in our home in the Adirondacks in New York State where she could swim all the time in the cool weather. He worked at it all the time. I think he was a pretty good swimmer. Smith: Did he talk politics much? Weill: Yeah, not necessarily because he wanted to. But I wanted him to talk politics about why are we doing something like this, or why are we doing something like that? Why can’t people just come together and think, “What is in the interest of our country?” rather than what is in their interest or what is in their party’s interest. And how these parties were migrating away from the system of conventions electing the candidates, and you can get three states like Iowa, New Hampshire, South Carolina, and when you get beyond that they’re forgotten. And it’s always chosen by the activists who are at the extreme of both of the parties. Smith: Most of us as we get older tend to become a little more conservative. There are a number of reasons for that. He seemed to be the opposite in some ways. He was always a fiscal conservative, but I wondered whether it was simply because the Republican Party had moved so much further to the right, or whether Mrs. Ford influenced his views. Weill: I think she influenced him a lot, as you would expect in people that had a relationship like they did, which was really beautiful. I was speaking to one of their sons, Steve, a few weeks ago. And I asked him how his mother was doing, and he said, “She really missed her best friend.” The only way a person becomes a best friend is a two-way conversation. So I think he listened, plus, he’d had great exposure. And I think he always wanted to learn, and he was in a learning mode through his nineties, really. Weill: Who is not touched by people that have a weakness like that? Smith: But I think that quality of compassion really flowered, and maybe that was a factor. Weill: But one of the things, I think, that Betty taught us all is, you’re better off talking about it than internalizing it and having it churn inside you, so that you also become a victim of that process, rather than being able to speak about it. Maybe you can help somebody else, and in talking about it, you are also helping yourself. And you are getting to think about what you can do that can make it better. And she thought about that a lot and I think it’s terrific that now her daughter has taken over for her at the Betty Ford Center, which is great. Smith: My sense is that they both really looked forward to their trips to New York. Smith: This city was a magical place for them. Did you sense that as well? Weill: Oh, yeah. And Betty loved it, and the President, except for a few days when he was running for president liked it. But this is an exciting city and they had a lot of friends here and it was a chance to get together. Madison Avenue was a great place. Smith: And they were theatergoers. Weill: They were theater goers. They always were treated great at the Waldorf, so they felt like New York was like a second or third home for them. When he was on the board of American Express and then what became Citigroup, those are no-slouch companies, or were not no-slouch companies that were really an important part of the American establishment. Smith: Somewhere I’ve read that he and Secretary Rubin were asked to be involved in a lobbying effort concerning some existing legislation. Is there anything to that? Weill: There is something to it, but not what you say. I asked President Ford – he was friendly with Phil Gramm who was the Republican leader in the Senate Finance Committee, which is the committee that looked after financial regulation. And I asked him if he could speak to Phil Gramm about why this would make sense – which he did. But Phil Gramm had his own agenda as it related to what President Clinton was doing, and he did not like this program where banks were forced to lend money in the inner cities to clients who were not very good. It was the Community Reinvestment Act. And he wanted that changed in the legislation. But that was between he and I, and not President Ford. Bob Rubin was a hundred percent against repealing Glass Steagall, for a completely different reason, in that he felt the elected person, the President of the United States, should be appointing the person that’s in charge of how banks operate, because how could they be responsible for an economy if they can’t have something to say about bank lending and what banks are doing to either help the country expand or not. And so he was okay with repealing Glass-Steagall, as long as the treasury, which is a part that’s appointed – the secretary is appointed by the president – so the Comptroller of the Currency would control what banks do. Whereas Greenspan felt that this should be out of the political arena, and be something that the feds should do because they are not so connected to the presidency. And lots of time they overlap, as a matter of fact. So Greenspan and Rubin couldn’t agree, and when Bob decided to leave Washington, and Larry Summers took his place, Larry didn’t think that this was his biggest issue. And within months, he agreed with Greenspan, and the disagreement ended. And my issues at the end was with Phil Gramm, who told me, if I don’t get the President to move in the next twenty-four hours, he is going to shoot his cannons and this thing is going to be done. And I couldn’t get the President to move, but his cannons didn’t go off. Smith: You mention about New York City. I’ll never forget, Hugh Carey told me once that he thought President Ford had never gotten the credit he deserved because, in Carey’s opinion, it was a sort of tough love approach with the Beame administration that actually forced the city into making some very difficult, but necessary, decisions. Weill: That’s correct. And that’s when the watchdog of Big Mac came into being, which helped the city get back on its feet. And listen, we’re all having that very same lesson today in just about every state and municipality in our country. We all have choices, and you can’t spend what you don’t have. So I think we are seeing our President today move closer to that position, and I think President Ford would be happy with seeing a little bit of our working together rather than the tough stuff on both sides, which is not what the people want. Smith: Can you imagine what he’d think about the deficits? A trillion dollar deficit. Weill: It got to numbers that were unbelievable. That clock doesn’t work anymore they had in New York which tells you what’s happening to the deficit by the second. But maybe we’re getting our act together. You can’t really cut back on everything when the economy is as weak as this. Personally, I think Europe is making some mistakes in being too tough. But as soon as we stabilize our economy and get it growing again, we’ve got to face these issues, both in the states and in the cities and in our country. Because this is unsustainable. Smith: So he left the board – when? Weill: I would say he left it about two years before he died. Smith: And I assume that was a source of real regret for him? Weill: But he couldn’t travel anymore, so he wasn’t able to come to the meetings. And it’s hard to keep up with something that is a dynamic process on the telephone. The meetings a lot of times are boring when you are there in person, but they are deadly when you are on the telephone. And to have to sit and listen to three or four hours of a meeting without the screens in front of you and everybody is doing PowerPoint and he didn’t have Skype. Smith: Oh, well. He was not technologically adept. Weill: I think adept is the wrong word. I think he ran the country pretty darn good without technology. I could relate to him a lot because to this day, I don’t know how to use a computer, I’ve never had a Blackberry, I never sent emails, which saved me maybe, and I don’t know how to use a calculator. I know how to do modern math and I know how to do something on the back of an envelope. And I think, like him, you communicate when you don’t know how to use all these things. It means you have to communicate with people directly. And that’s how you really find out what’s going on. I don’t think it’s not-adept. We each have to operate in how we think we can do it best, in the most comfortable way for ourselves. Smith: He learned to play Solitaire on the computer. And he could get email, he just couldn’t reciprocate. Mrs. Ford, on the other hand, apparently was pretty computer literate. Weill: Well, that’s helpful. Yeah, my wife can do it. And my secretary. Smith: A perfect division of labor. Weill: Yeah. In the last few years we talked about it a little bit. I retired as CEO of the company in September of ‘03, and as chairman in April of ’06. And we were talking about it in that period when I was chairman, and then after I had left the company and I think he probably…when did he die? Smith: He died in December of ’06. Smith: Were you surprised when he died, the amount of public response that there was? Weill: It was really, really terrific. Smith: Because he’d been out of the public eye for a while. Weill: But it was happening because the discussions about what he did were more and more about the pardon of Nixon, and about his following up, and the people that he had, and the quality of the staff work that was taking place in that administration. I went to his 90th birthday party, which President Bush had for him at the White House. It was a pretty small party, about 80 or 90 people, and this is the younger Bush. And Bush was pretty funny and the President was very funny, but all of the people from his previous administrations and the ones he worked with in Washington. Even the ones that don’t speak to each other anymore, and are mad at each other, they came. Weill: Because people thought that nothing was happening, and yet he took the best of what Nixon had, and got them all to work together in a much more transparent way, so that they were able to accomplish a heck of a lot more. And I think it was unfortunate in my mind who he picked as a running mate, which really didn’t work that well at that point in time. And especially what happened in New York with his Treasury secretary who ate apples every day. Weill: Secretary of the Treasury, Bill Simon, who was very adamant. The thing that framed this, “Ford to New York: Drop Dead,” in the Daily News, when really, I think, as Carey said, it was really Ford to New York: This is what you have to do. And if you do that, we’ll work with you. Which is really what ended up happening. But it didn’t happen in time for that election. That election was very close, and New York was not a runaway. Smith: Do you think – and I realize it is totally speculative – but I’m fascinated to know what you think: Had he kept Rockefeller on the ticket, do you think it might have made the difference in New York? Or in other states? Weill: Yeah, it’s not something that I like to speculate upon because it’s hard and no real purpose is ever served by “jeez, if I’d wanted this person to be my successor in X city, rather than the person that we ended up choosing, the company might have done a lot better.” What good does that do? That was not the choice, and that was not what happened. Weill: So, recognizing all that, my answer is yes. Smith: One last thing. If you were going to tell people something surprising, something that maybe most people never really thought about Gerald Ford. Something that maybe went counter to the image, or something that you uniquely, because of your relationship, had an opportunity to learn about the man. What would you say? Weill: He was a real person. I think if I say something more it takes away from what I just said. Because I think so many of them get carried away with what they are. Bill Clinton said this to me just the other night – that he didn’t know any president, he can’t imagine a person being prepared to be the president; doesn’t care what their experience was. He was a governor of a state for eight years, and he ran something. And he said when he became the president, he had not a clue and the first couple of years showed that. So we now have a president who really didn’t have much experience at all. So it’s on the job training, and even if you’ve had a ton of experience, it’s on the job training. So President Ford had those two years, but it was a tumultuous time in the country and, listen, could the country have done much better if he was re-elected rather than Jimmy Carter being elected for the next four years. Again, I don’t want to speculate, but the answer is yes. Smith: It’s interesting because President Ford felt he had just mastered the job, when he lost it. Weill: I think that’s probably true. Just think of the people he had. Smith: No one would have imagined that these two men would become very good friends, which is a wonderful tribute. Smith: And in fact, members of the former presidents club never quite understood how they could be friends. Weill: And they each said they were going to go to each other’s funeral. I remember Betty telling me that. Smith: Right after the election Ford was down, and we’ve been told by more than one person in the White House, he said, “I can’t believe I lost to a peanut farmer.” He summed it up. A competitive guy. Weill: Well, you obviously don’t get to be in that position without being competitive. But I think history will have President Ford being one of our very good presidents, although short.